Mitochondria (singular = mitochondrion) are often called the “powerhouses” or “energy factories” of a cell because they are responsible for making adenosine triphosphate (ATP), the cell’s main energy-carrying molecule. The formation of ATP from the breakdown of glucose is known as cellular respiration. Mitochondria are oval-shaped, double-membrane organelles (Figure 14) that have their own ribosomes and DNA. Each membrane is a phospholipid bilayer embedded with proteins. The inner layer has folds called cristae, which increase the surface area of the inner membrane. 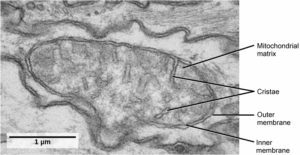 The area surrounded by the folds is called the mitochondrial matrix. The cristae and the matrix have different roles in cellular respiration. Like mitochondria, chloroplasts also have their own DNA and ribosomes. Chloroplasts function in photosynthesis and can be found in eukaryotic cells such as plants and algae. Carbon dioxide (CO2), water, and light energy are used to make glucose and oxygen in photosynthesis. This is the major difference between plants and animals: Plants (autotrophs) are able to make their own food, like glucose, whereas animals (heterotrophs) must rely on other organisms for their organic compounds or food source. Like mitochondria, chloroplasts have outer and inner membranes, but within the space enclosed by a chloroplast’s inner membrane is a set of interconnected and stacked, fluid-filled membrane sacs called thylakoids (Figure 15). Each stack of thylakoids is called a granum (plural = grana). The fluid enclosed by the inner membrane and surrounding the grana is called the stroma. 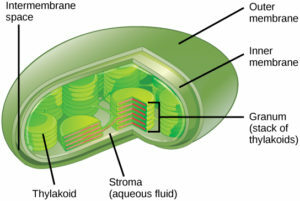 Figure 15 This simplified diagram of a chloroplast shows the outer membrane, inner membrane, thylakoids, grana, and stroma. Scientists have long noticed that bacteria, mitochondria, and chloroplasts are similar in size. We also know that mitochondria and chloroplasts have DNA and ribosomes, just as bacteria do. Scientists believe that host cells and bacteria formed a mutually beneficial endosymbiotic relationship when the host cells ingested aerobic bacteria and cyanobacteria but did not destroy them. Through evolution, these ingested bacteria became more specialized in their functions, with the aerobic bacteria becoming mitochondria and the photosynthetic bacteria becoming chloroplasts.